The SSFSA has teamed up with StrucSoft solutions to expand our role in BIM services. The Supreme Framing System was added into StrucSoft MWF Pro Wall add-in, with their most recent update. 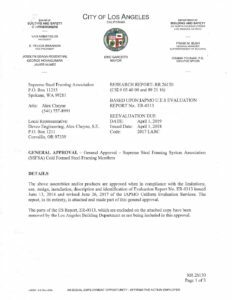 Designers and drafters now have the ease of specifying Supreme products throughout the drafting process. The video below gives a brief look at the capabilities of the software. StrucSoft Solutions MWF software is compatible with Autodesk’s Revit software and is available for purchase at www.strucsoftsolutions.com. If you have already purchased the add-in software, then all of the Supreme products are included in the most recent update. In addition to the products being incorporated into StrucSoft software, all of the section profiles are available for free download below. Note: The .rfa files must be saved to your computer and then opened from your computer. To do this, right click on the .rfa link and choose ‘save target/link as’.